"The 4-hands massage was awesome. I usually follow the flow of the massage in my mind but following a 4-hands massage was mesmerizing, so I finally gave in and just relaxed and enjoyed. You and Aaron are both wonderful massage therapists. Thanks for everything and I will see you in March." The caring, experienced massage therapists at Sioux Falls Therapeutic Massage are continually improving their knowledge and skills by increased study and attending advanced training seminars. We adapt these skills & techniques to meet the challenge of our clients specific wants and needs. Here is a brief summary of some of our services. You can also read some "Recommendations" from our clients. We look forward to helping you feel your very best. Come see our therapists at both locations. All of us feel the stresses of everyday living. Pain from injury or illness deprives us of good sleep. Soon life is controlling us rather than us being in control of life. It is a discouraging cycle. Sioux Falls Therapeutic Massage can break the cycle. Massage allows our internal systems to unwind; the mind clears ; the body relaxes; pain is reduced as muscular tension releases. This allows longer, more comfortable sleep. The immune system functions better with massage. As one doctor said, "Massage is good medicine." Michael Phelps received at least 2 massages daily during the 2008 Olympics & Dara Torres brought her own therapist with her. They know sports massage helps to relax over-tightened muscle. Increased circulation removes metabolic wastes & brings in needed oxygen & nutrients. This nourishes and repairs sore &/or injured muscles. Deep tissue massage. Normal function & quicker recovery results allowing more quality workouts & an edge during competition. Contact us to find out how Sioux Falls Therapeutic Massage can benefit you. Ask one of our sports therapists to come & speak to your team. Get a Coupon. On-site chair massage is convenient. Sioux Falls Therapeutic Massage comes directly to your office, work-site or other location, carrying easy to set up portable massage equipment--on-site chairs or tables. Tell your employees that they are appreciated. Reward the volunteers who helped in a fundraiser. Thank the staff at the nursing home or hospital. Plan a benefit for the local symphony? Entertain at your house? Family Reunion? Bridal Shower? Wedding Rehearsal? Having a Grand Opening? Teacher Appreciation? Nurses Appreciation? Call us with any ideas you may have besides those listed. It is Great!!! Pregnancy massage is designed for the expectant mother's needs. It is also called pre-natal massage. Many women suffer from aches, pains, stiffness and tension during pregnancy. Gentle massage at Sioux Falls Therapeutic Massage can help relieve problems such as backache, sleeplessness, edema, headaches, and other minor complaints. We use special tables, cushions and pillows to keep "Mom" & baby comfortable & safe. Others will envy massage experience. A Couples Massage allows two people to be in the same room receiving a massage at the same time from two different massage therapists. This a a great experience for any couple -- mothers, daughters, sisters or friends can enjoy this massage together. You will be in a relaxing atmosphere with soft music in the background. You won't be disappointed as you relax and unwind together. We can arrange for 30, 60 or 90 minutes. You can also add the warmth of hot stones. Hot stone massage is a specialty massage that uses smooth, heated stones. It is a deeply soothing, relaxing form of massage that helps tight muscles release. The therapists at Sioux Falls Therapeutic Massage use traditional strokes of Swedish massage while holding a heated stone As the stone cools, the therapist replaces it with another. We also leave heated stones in specific points along your spine, or in the palms of your hand, or even between your toes to improve the flow of energy in your body. If you haven't tried it, now is a great time to call. 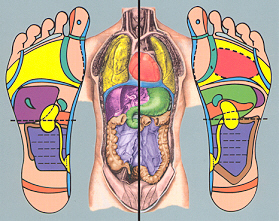 Reflexology is based on the scientific theory that there are specific areas on the feet and hands that affect other areas of the body when they are worked on correctly. By stimulating these reflexes properly, the experienced therapists at Sioux Falls Therapeutic Massage can help many health problems in a natural way, a type of preventative maintenance. 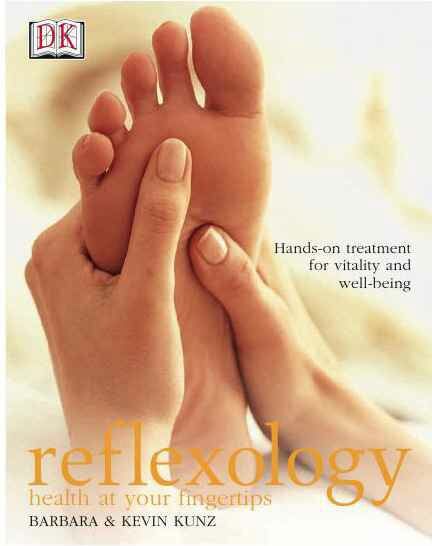 Reflexology is a serious advance in the health field and should not be confused with swedish massage. It was practiced as early as 2330 B.C. by the Egyptian culture. Experience the benefits. When it comes to massage , "four hands are better than two". Two therapists work in unison, hands and arms flowing over your body like the ocean. You lose track of where you are, mental chatter disappears, your mind and body are set free. At Sioux Falls Therapeutic Massage this is an extraordinary, over-the-top experience & double relaxation. This will be a massage to envy. Raindrop Therapy Massage is a sequence of fragrant aromatherapy oils dropped onto the spine from about six inches. The oils are worked into the muscles along the spine to stimulates the nervous system and disperse the oils throughout the entire body. Nine pure oils and blends are applied one by one in a carefully choreographed way for optimum benefits. After the essential oils have been applied, a warm, wet towel is placed on the back to help the oils absorb into the body. The oils will continue to linger and work within the body for a week or more. The pure essential oils used by can affect every cell of the body within 20 minutes and are metabolized like other nutrients. It is a healthy and relaxing experience. Only with Don Spade. EXCELLENT FOR ALL BABIES AND PARENTS! In home massage is great for those who prefer not to get up after a massage to regain body tension due to traffic and the commotion of the outside world! With our mobile massage therapy, you can stay home, cozy up with a great book, go to bed, take a warm bath or just RELAX! Our professional mobile massage therapists are scheduled by appointment.. In home massage available as early as 7:00am and as late as 9:00 pm. Mobile massage is available in the Sioux Falls metro area. MasterCard, VISA, Discover cards accepted. Leave a message on our appointment request line. Call 1-605-338-9266 today! Scheduling mobile day spa services with Sioux Falls Therapeutic Massage provides you with Quality, Affordability & Reliability. We are the leading & preferred local mobile massage service. Read our massage reviews to find out why! The lymphatic system flushes waste from the body and keeps our immune system fighting. Lymph fluid moves slowly & inactivity can seriously restrict its flow. Muscular contraction & deep breathing is the primary means by which our lymph circulates, but lymphatic massage and drainage provide another helpful option. It is a light, rhythmical massage which encourages elimination of waste, excess fluid, and bacteria. It is performed to improve the flow of lymph by stimulating the vessels. The benefits of this treatment include detoxification, increased fluid movement, increased cell regeneration, boosting the immune system and general healing and break-up of scar tissue. If you have been injured , such as in an automobile accident, your doctor may prescribe medical massage as part of your treatment plan. Massage can address the stress from a traumatic event and can help the muscular sprains, strains and other injuries. At Sioux Falls Therapeutic Massage the goal of medical massage is to reduce stress, reduce pain & swelling, increase circulation and improve range of motion to normalize full muscular functions. We will keep all records needed for the doctor, insurance & attorneys as needed. Call us to answer any questions about insurance, scheduling, etc. Let us help. We incorporate Swedish massage with other techniques that include neuromuscular therapies, orthobionomy, deep tissue, passive positioning, stretches, hot stones, reflexology, indirect lighting, background music and aromatherapy. Our clients feel better because we always adjust to make it your massage, your way & priced right.